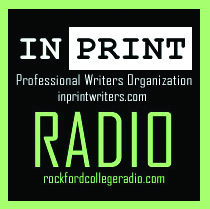 In Print Radio is on the air! Our first episode will stream on Rockford College Radio Monday morning, Labor Day, at 10 am. Sandy Colbert hosts a roundtable discussion with founding members Carol Ahrens, Mary Lamphere, Kristin Oakley and Kathleen Tresemer. They discuss why they founded In Print and what the organization plans to do in the future.